An attack of vertigo normally lasts from a few seconds to a few minutes. If it lasts more, then the patient should consult a doctor for a more serious checkup as there might be presence of another serious anomaly. discomfort comes in varying intensities and duration as well. It might be possible that some, actually very few patients experience a very sudden onset of a vertigo episode that may last for hours as well. But, as mentioned, if an attack lasts for more than a few minutes, a further and a more detailed check-up is advised. A low salt diet is recommended with intra-tympanic injections of the antibiotic gentamicin or a benzodiazepine like diazepam to sedate the vestibular system. 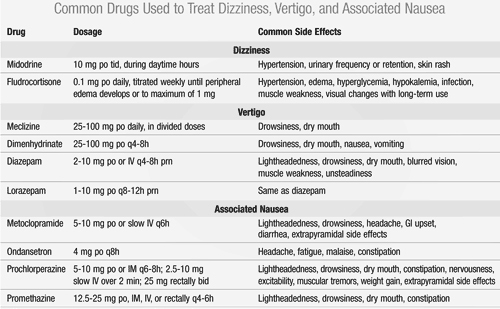 However, there are no studies done yet to prove the efficiency of these medications, but these have been prescribed for vertigo for many years. Common side effects include drowsiness, constipation, tiredness, headache, insomnia, twitching of shoulders, face and neck. These side effects usually go when the medications stopped. Vertigo can even occur twice or more than that with in a period of a few days to weeks. An episode might appear twice a week or even twice a month. Some patients may only feel a slight loss of balance whilst others may feel complete imbalance and unsteady all day long or for long periods. The treatment may range from 3 – 14 days. If the patient is prone to vertigo attacks, a short supply of treatment is advised to be kept at home always. Completing personal loss of sleep. Having a healthy diet of vitamins and minerals. Lemon in salads is another good option. High intake of liquids is often advised to the patients of vertigo. Avoid sudden jerks or movements leading to imbalance while getting up from the bed. Some ripe strawberries mixed with yogurt is a good home remedy. Almonds grinded and mixed with warm milk are often considered the best home remedy. A ginger tea or on the appearance of the attack, tasting of lemons or black pepper is helpful.